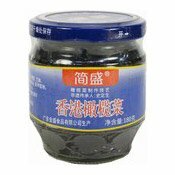 Instructions for Use: Use as condiment for Chinese cuisine. Ingredients: Mustard Leaves (75%), Vegetable Oil, Olive (3%), Salt, Flavour Enhancer (E621), Preservative (E211). Simply enter your details below and we will send you an e-mail when “Seasoned Mustard Leaves Olive Flavour (簡盛香港橄欖菜)” is back in stock!